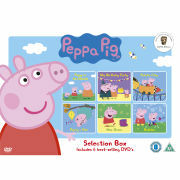 Join lovable Peppa and friends for 10 more brand new piggy tales! My 2 year old and 4 year old absolutely love Peppa Pig's Potato City, and it keeps them entertained for hours. It's worth every penny! Great brand new piggy tales!